I don’t know about you, but if I don’t plan a dinner with vegetables in the main dish, I sometimes forget for a minute that I need to feed my family some sort of food besides pasta and protein. 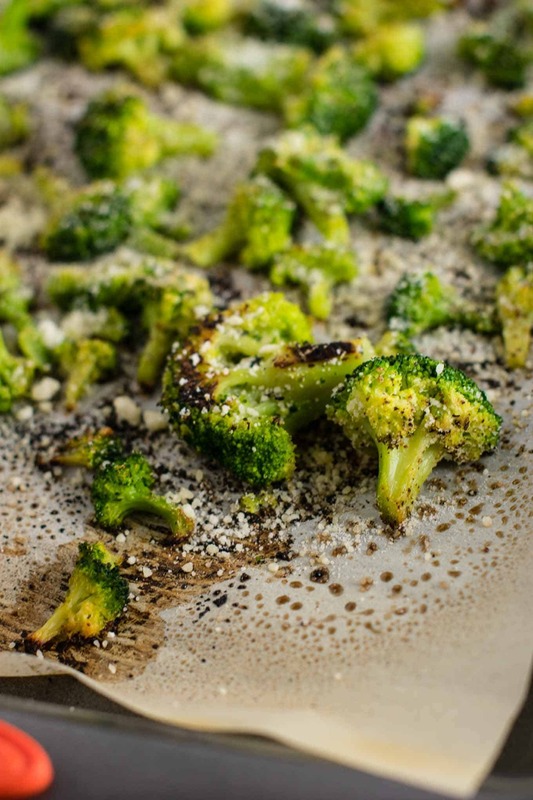 If you’ve ever wondered how to roast frozen broccoli, this is the best way that I have found! This broccoli changed my life y’all. ready for the oven in two minutes. You can’t beat how simple this is! Saves me so much time AND I feel good about getting some veggies on the table without a lot of effort. I love fresh broccoli, but it takes a good 5 – 10 minutes to cut up and get ready. Making frozen broccoli in the oven requires almost no prep work and I can literally get it from freezer to oven in about two minutes. That can’t be beat! And for $2 – 3 a bag, this broccoli is a cheap side dish. The method is key for this recipe. First up, you’ll need to line your baking sheet with parchment paper. This helps avoid any sticking and burning of the broccoli. Do not cook your broccoli directly on a pan as it will stick and not cook properly. Next tip: use olive oil spray instead of olive oil from a pour bottle. The reason for this is that the oil is harder to toss the broccoli in while frozen. 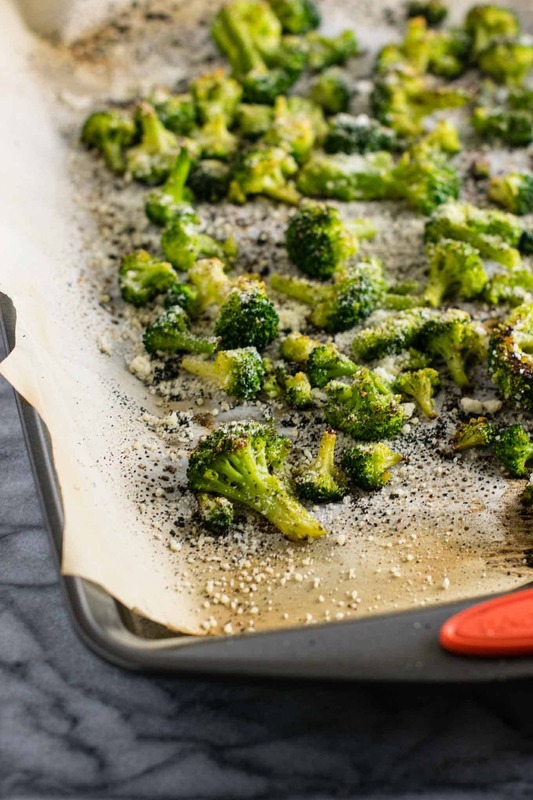 We don’t want to waste time thawing the broccoli and want to get it in the oven as quick as possible. 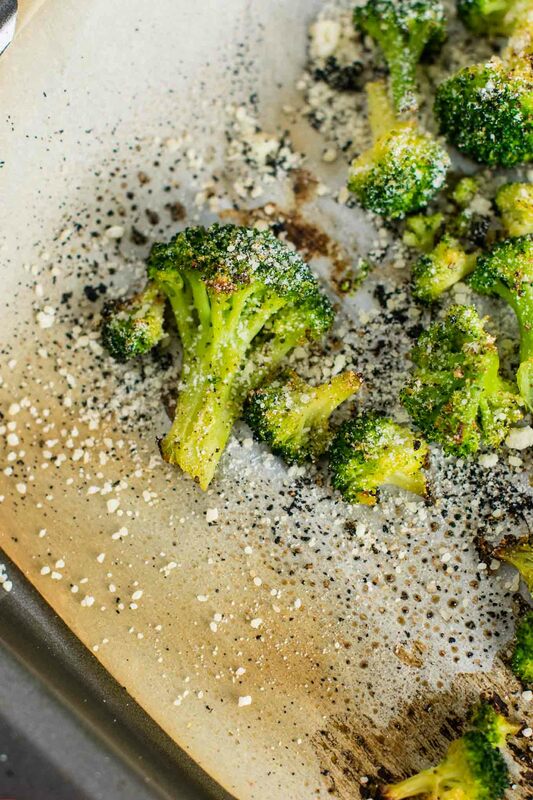 Olive oil spray is so convenient to use, and you can just spray the tops of the broccoli to coat and be done in 10 seconds. 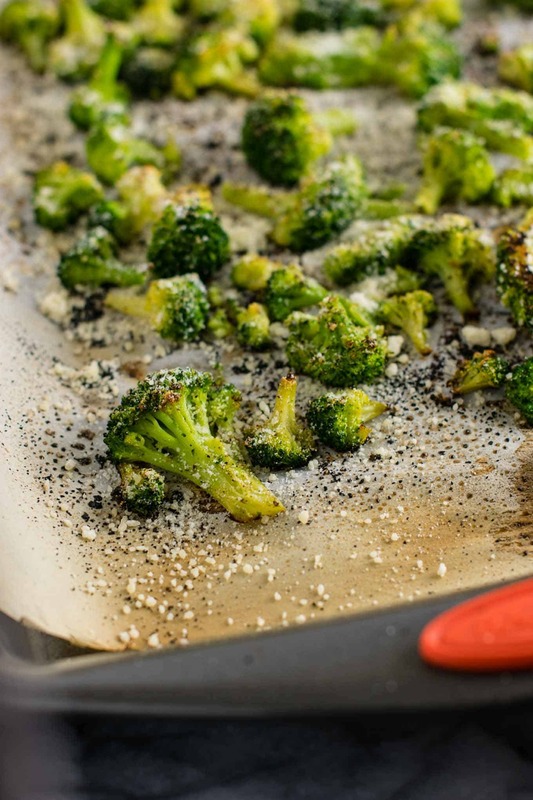 Once I put the broccoli on the parchment paper, I give it a good spray to cover evenly with olive oil. Do this before the spices to help them stick. 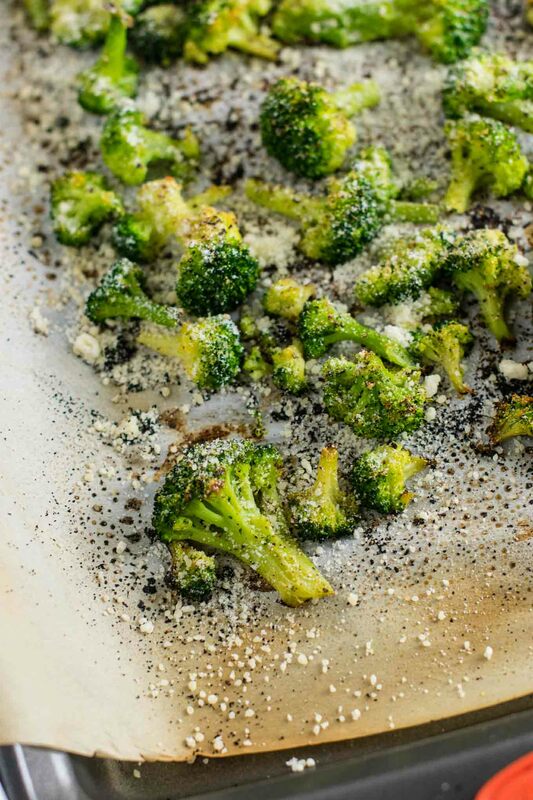 The spices won’t stick as well to frozen broccoli without oil, so be sure not to skip this step. Next, just sprinkle on even amounts of salt, pepper, garlic powder, and onion powder over the tops of the broccoli florets and toss it in the oven! No need to stir it around or anything. 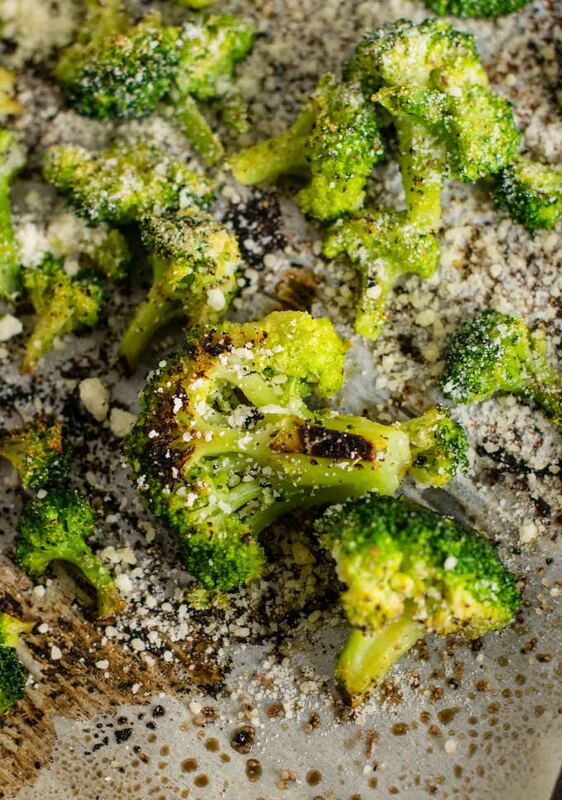 Roast for 15 – 20 minutes, or until the broccoli is as crispy as you want it. Remove from the oven and sprinkle on parmesan cheese, or nutritional yeast if you want to keep it dairy free. So good and ridiculously easy! If you need a quick and easy veggie go to dish, this is the answer! 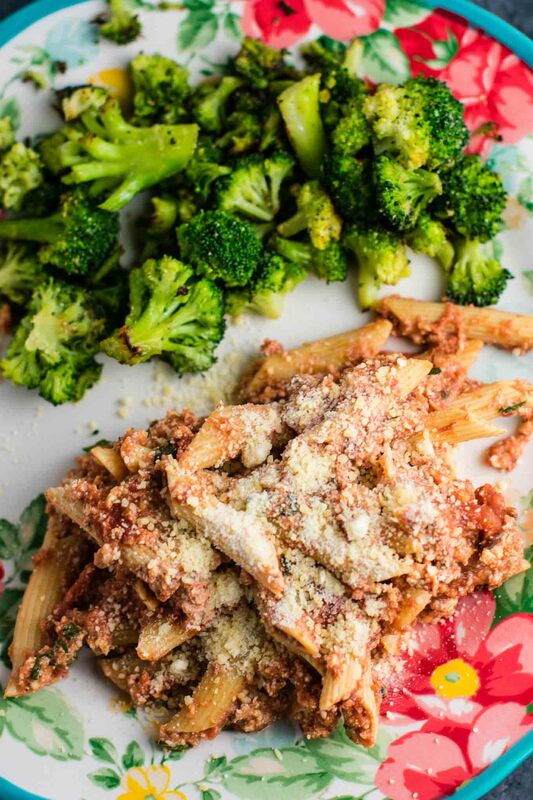 My favorite way to eat this oven roasted frozen broccoli is alongside my Easy Crock Pot Baked Ziti (pictured below). We ate it two days in a row and I couldn’t get enough. Half a plate of pasta and half a plate of veggies and I was full. I easily could have eaten the whole tray of broccoli myself, it was that good! I’m so glad that I know how to make broccoli from frozen now. It is so convenient! Please try this recipe and let me know what you think in the comments below. Hungry for more? Here are some easy side dish recipes to go with your dinner! If you love this recipe, be sure to also check out my roasted frozen carrots recipe for another similar dish! 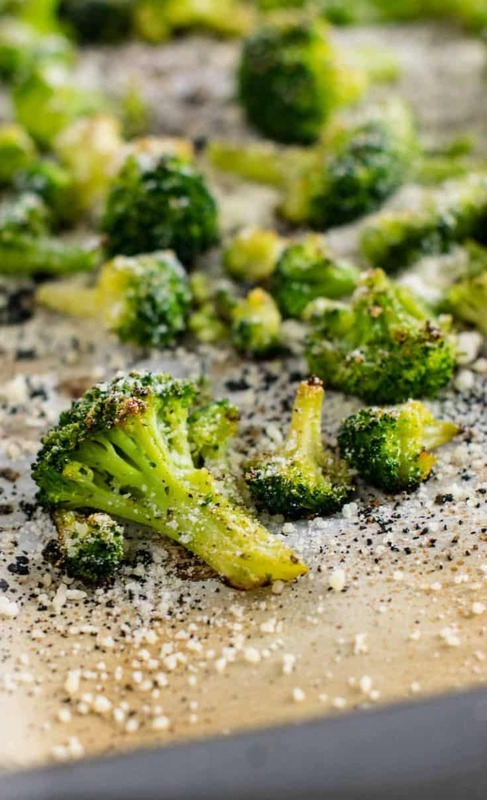 Learn how to roast frozen broccoli with this simple and delicious recipe! This was very good, and so easy. Thank you for this recipe. This is a GAME CHANGER!! I’m cooking for myself and a child, so it’s difficult to keep fresh produce fresh long enough for us to get through it all. Frozen broccoli is a bit meh when nuked, but we LOVE roasted! I’m definitely trying this tonight with our macaroni casserole.